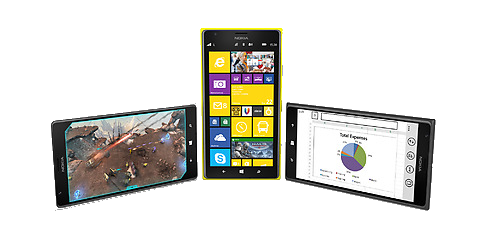 The Nokia Lumia 1520 has been seen in a few leaked images and has been amongst the devices on the industry gossip grapevine for a while and now as it is official let’s take a closer look at this big screen smartphone. Nokia has created this phablet with a huge 6-inch display that includes ClearBlack technology making it work just as good outdoors as it will inside and Windows Phone 8 is on board. One of the top-end features of the Nokia Lumia 1520 is the 20-megapixel PureView camera which includes many great editing features including the 5-megapixel sharing option so you can upload a lower resolution version of your pic to your social networks using less data. Optical image stabilisation is on hand to combat blurring on photos or shaking in video footage and even though this phone isn’t packing the 41-megapixel snapper as seen on the Nokia Lumia 1020 is still delivers great images. The Nokia Lumia 1520 is also able to output RAW files which is bound to appeal to the professional photographer or advanced novice, although these can’t be edited on the phone itself. The Storyteller function is a neat feature which will create a story by placing your photos on a map. All the usual PureView functions and Nokia Camera app features are on board too including the ability to add filters and effects to your images and the 6-inch screen makes playing around with your images easy going. With Microsoft Office on board the Nokia Lumia 1520 lets you keep up with work files on the move and you can save them on SkyDrive to pick them up later or access them from a PC. Windows Phone 8 offers up the distinctive Live Tiles homescreen design which can be customised with favourite apps and includes features such as People Hub and Xbox Live Hub. The phone supports 4G, Wi-Fi and NFC and there is a front facing camera for video chatting . Nokia has confirmed that the Lumia 1520 will go on sale in various markets soon, but as this is the first official glimpse we have had it could be 2014 before it hits UK stockists.